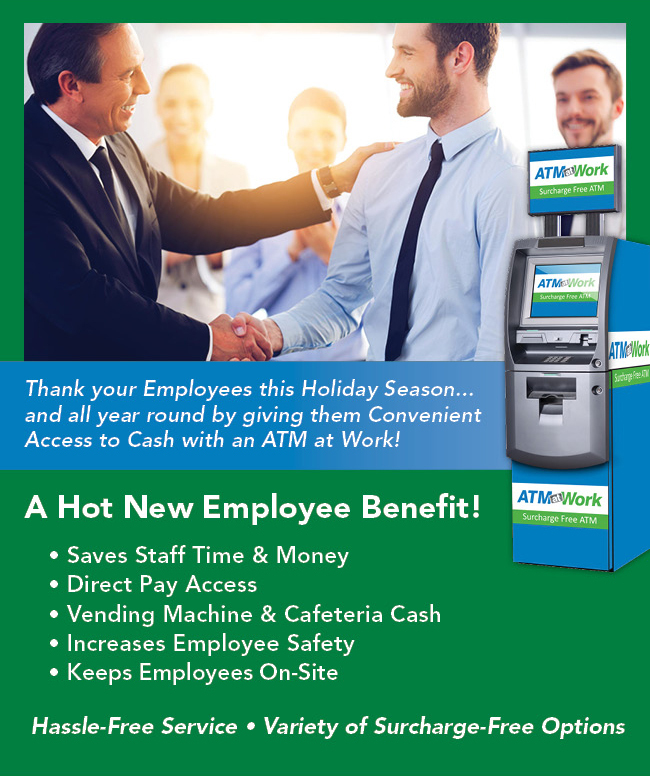 Thank your Employees this Holiday Season... and all year round by giving them Convenient Access with an ATM at Work! Your employees are using an ATM and chances are they are spending a great deal of their paycheck on fees to obtain cash. Many Human Resource professionals recognize this and that’s why having ATM in the building to give their staff easy access to cash — surcharge-free — is becoming one of the hottest new employees benefits being offered by employers. Having an ATM on-site Saves Employees Time and Money, Keeps Staff at Work and provides a Convenient and Safe Environment for employees to do their banking. And best of all ATMatWork offers ATM options that are Hassle-Free and, in most cases, less than what you pay in insurance for one employee each month. Contact the payment professionals at ATMatWork to get started. Older PostBe a Human Resource Superhero by Providing Your Staff with an ATM at Work!